How Beneficial Is Sweet Basil? In Hinduism, basil is believed to be the incarnation of Lakshimi, the wife of Vishnu, and it is called “The Incomparable One” and “Mother Medicine of Nature”. With its strong and sweet smell, it has been cultivated for more than 5000 years and for centuries, it was used for its health benefits. Basil is a bushy annual plant that grows best in tropical climates. The one most of the people usually know the best is Mediterranean basil or sweet basil. It is known for its light green and silky leaves, and big white flowers that are arranged in terminal spike. Other species have different colour of the flowers and shape of the leaves. For instance, Asian basil has pink, purple or red flowers, and hairy steams. Thai basil has narrow leaves with licorice aroma. There are many popular species: Thai basil, Lemon basil, Cinnamon basil, African blue basil, Asian basil, Lettuce leaf basil, and Holy basil. For centuries, all parts of the plant, leaves, seeds, roots, flowers and essential oil, have been used in medical purposes. John Gerard, the herbalist, noted that basil was used for relieving the pain from scorpions’ stings. Other used it for better blood circulation, as a protection from infections and for brain stimulation and concentration. One of the most important vitamins that sweet basil contains is certainly vitamin A. We all need to satisfy our daily intake of vitamin A, and we can easily do it with this plant. It noted that 100 grams of fresh sweet basil leaves contain 175 % of the required daily doses. This vitamin is an antioxidant, and it is important for our skin and vision. Researches also showed that consumption of the food rich with vitamin A helps the body protect from lung cancer. Another important vitamin is vitamin K, essential for bone strengthening and mineralization. As for the minerals, this plant is great source of potassium, magnesium, manganese and cooper. Fresh sweet basil leaves are rich with iron; 100 grams contains 3.17 mg. 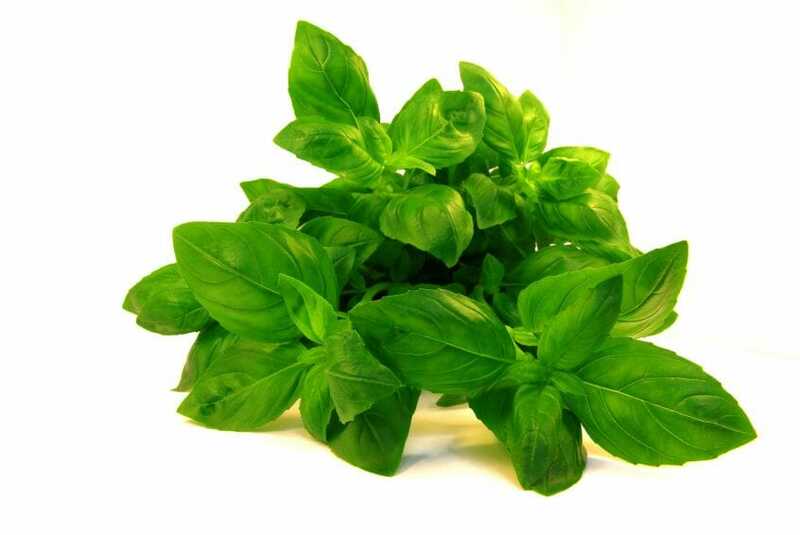 Basil herbs in general have high level of beta-carotene, lutein, zea-xanthin and cryptoxanthin that protect the body form free radicals and reactive oxygen species. Zea-xanthin in particular protects from UV rays, and age – related macular diseases. Sweet basil contains beneficial essential oils; eugenol, citronellol, linalool, citral, limonene and terpineol essential oils. Being very low in calories and without cholesterol, basil is essential for optimum health. Many researchers have shown that essential oils found in sweet basil have many benefits for our health. The basil oil is known to have antioxidant, antifungal, antimicrobial, and antiviral properties. In aromatherapy, basil oil is used to treat asthma, and diabetes, especially in India. One of those important oils is eugenol that acts against cycloxygenase (COX), an enzyme responsible for inflammatory mediation. For those who are suffering from rheumatoid arthritis, osteoarthritis, and inflammatory bowel condition, sweet basil can offer great help in treatment. Other studies documented that basil oil is also very beneficial for bacterial infections. Sweet basil can fight pathogenic bacteria such as Staphylococcus, Enterococci, Shigella and Pseudomonas. As health tonic, sweet basil is used as a remedy against sleep difficulties, stress, nervousness, and depression. Treating kidney stones with basil juice has showed great results. Mix the juice of basil leaves with honey, and drink it every day for six months. This remedy will also strengthen the kidneys; however, consult with medicinal officials before the treatment. Infections of the mouth can be also healed with basil leaves. Chewing it twice a day will help with these infections. Due to vitamins sweet basil contains, it can be helpful remedy for eye disorders, that is, sore eyes and night-blindness. Many opt to drink sweet basil tea and use it as a remedy. The truth is that fresh leaves are more beneficial for our body, because when dried, leaves lose some of its benefits. For making a tea, use two tablespoons of fresh leaves for one cup of boiling water and drink it one to two times a day. People also used to snuff dried sweet basil leaves as a remedy for cold. Due to the ability to enhance the effectiveness of insulin, people with diabetes should use sweet basil with caution and with the approval of health care provider. Famous in religion and culture, and worshiped as a powerful remedy that treats all aspects of life, sweet basil surely is a necessary plant. Fetrow, C. W. & Juan R. A. (1999). Professional’s Handbook of Complementary & Alternative Medicine. Springhouse, Pennsylvania.